You are here: home > geotopics > limestone > what is limestone? Limestone is an organic, sedimentary rock. This means it was formed from the remains of tiny shells and micro-skeletons deposited on the sea bed. Over the years this sediment was compressed to form solid rock. Limestone is formed in layers - called bedding planes. These bedding planes contain vertical cracks called joints. Joints and bedding planes make the rock permeable. 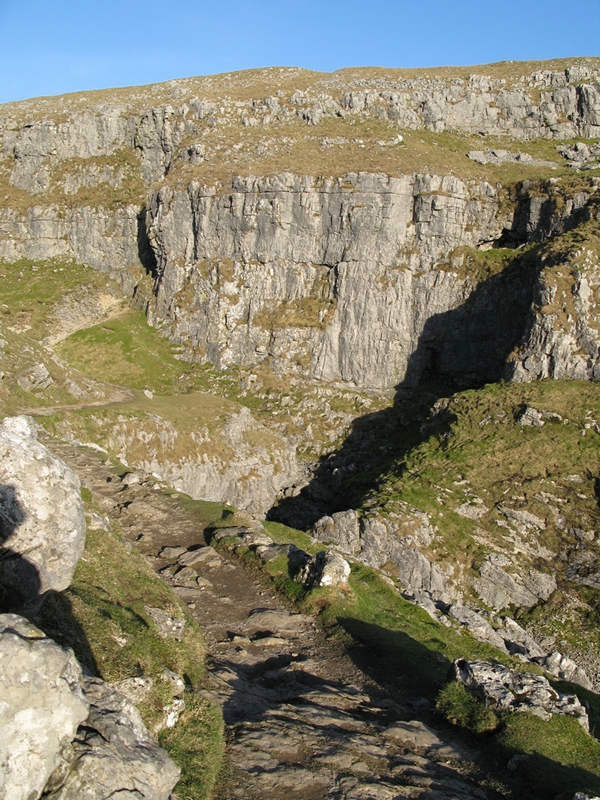 The image below shows joints and bedding planes at Malham Cove, Yorkshire Dales. Weathering is the breakdown of rock by physical, chemical or biological processes. Limestone areas are predominently affected by chemical weathering when rainwater, which contains a weak carbonic acid, reacts with limestone. When it rains limestone is dissolved. Rainwater erodes the vertical joints and horizontal bedding planes. In doing this karst scenery is created. Surface water passes over impermeable rock until it reaches permeable limestone. The water passes over the limestone and erodes vertical joints to form swallow holes. Over time the swallow hole increases in size as the result of erosion (often by solution when slightly acidic water chemically weathers the limestone).Swallow holes also appear when caverns under the ground collapse. Swallow holes are also known as sink holes. The image below shows a swallow hole. Water is flowing from the left to the right of the image and disappears down the swallow hole. The swallow hole has been formed as the result of chemical weathering along a joint in the limestone bedding plane. Resurgence - when water flows down a swallow hole it fllows underground along bedding planes and down joints. This continues until the water reaches an impermeable layer of rock. Water then flows over this until it re-emerges. This is known as a resurgence. Below is the resurgence at Malham Cove. You can see a video featuring this resurgence on the Malham page. Gorges - these are created where the roof of a large underground cavern collapses, to create a steep sided gorge with a river running in the bottom. An example is Cheddar Gorge. 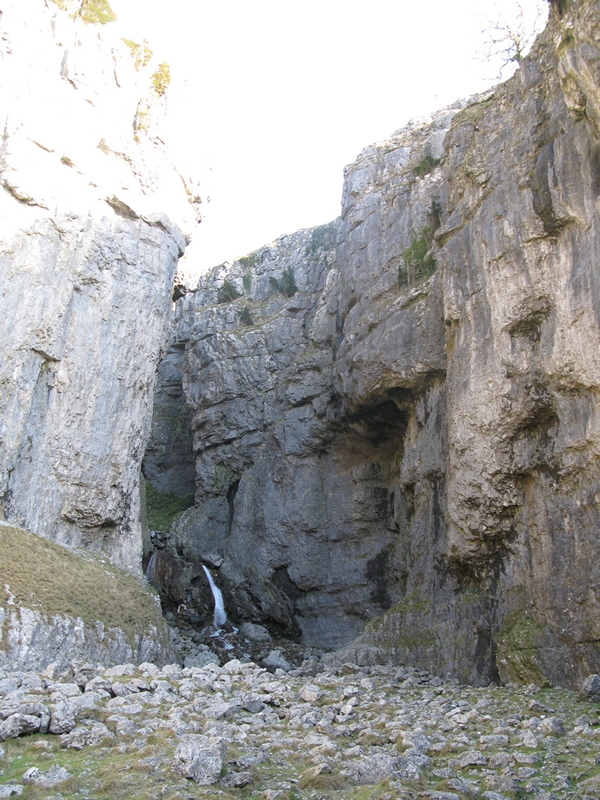 Another example is Gordale Scar gorge which is shown in the image below. 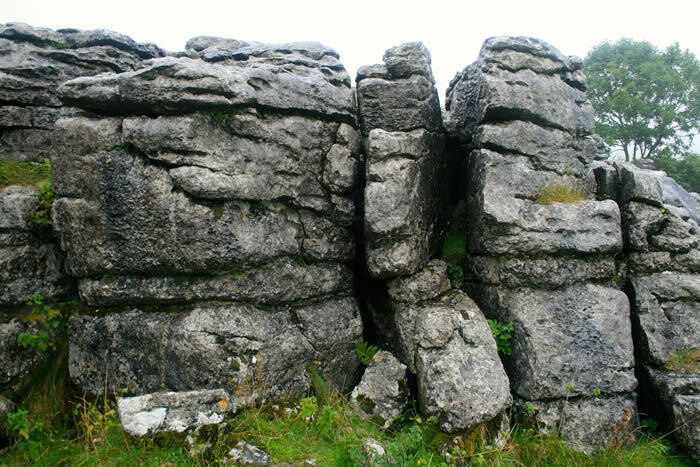 Clints and grykes - rainwater flowing over an impermeable surface will, on reaching (permeable) limestone, be able to dissolve the joints into grooves called grykes, leaving blocks or clumps of limestone in between called clints. You can see a video featuring these formations on the Malham page. Limestone pavements - eposed clints and grykes. 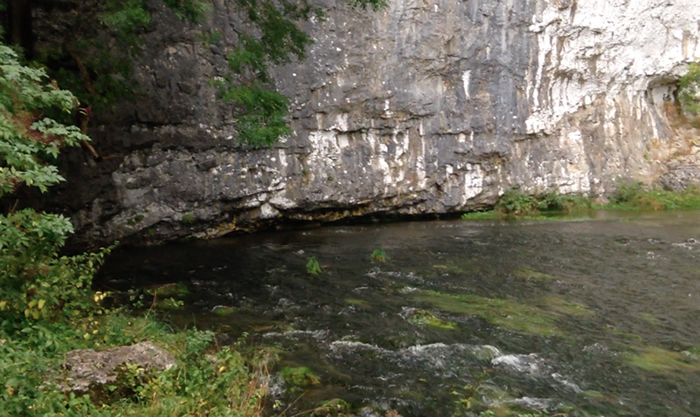 The video below shows a limestone pavement at Malham, Yorkshire Dales. Stalactite - water dripping from the roofs of caves leave behind microscopic particles of calcium carbonate. These build up as icicle shaped stalactites. Stalagmite - drips splashing onto the floor of caves leave behind microscopic particles of calcium carbonate. These build up on the floor of caves. Pillar - where a stalagmite and stalactite join you get a pillar. 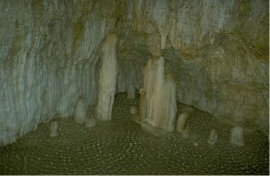 Cavern - an underground cave that has been hollowed out by the action of underground streams and by carbonation and solution. 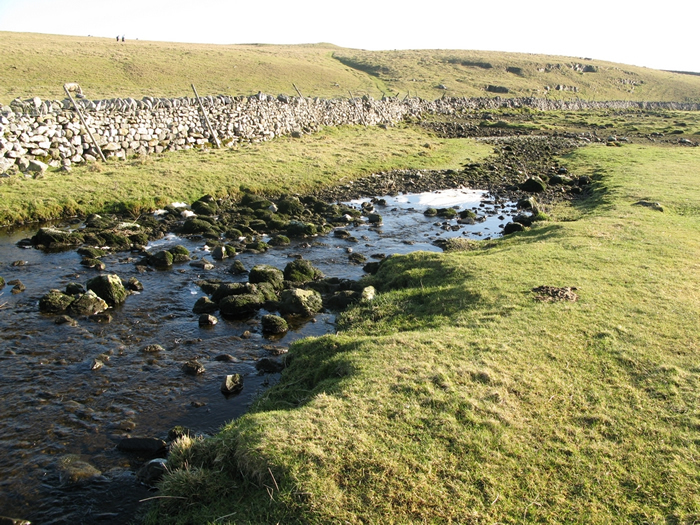 Find out more about Malham in the Yorkshire Dales, a great case study of a limestone envrionment on the Malham page.